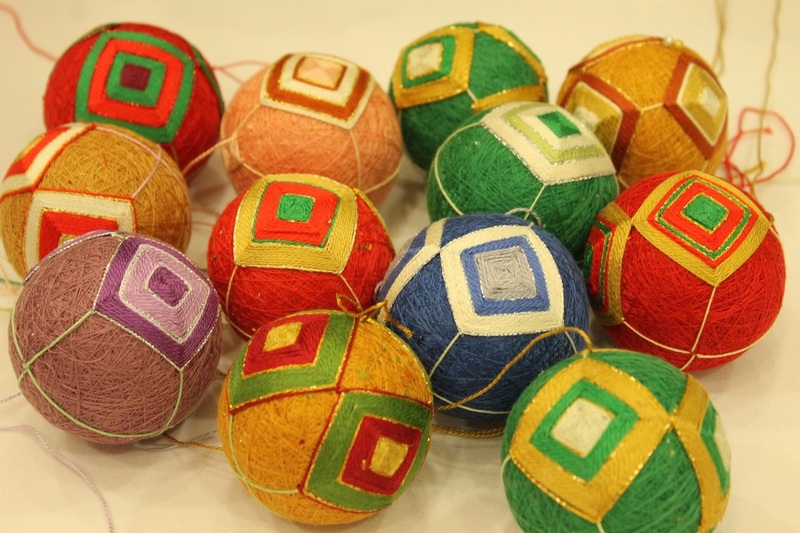 Learn the Japanese art of temari and how to wrap, measure and embroider a ball. Ladies of 17th century Japan would challenge each other to see who could embroider the most beautiful designs using scrunched up pieces of silk to create the core of the ball. Also originally used as toys for children, the temari balls became ever more intricate and ultimately became the decorative items they remain today. Level 1 Temari workshop, suitable for complete beginners and all abilities. This workshop will be run again in 2020. ​Please contact us to register your interest for this and future dates. In our workshop, we use a wrapped polystyrene ball as a base for the embroidery, thus ensuring a good round shape. You will learn how to wrap, measure out and embroider one ball, and will have a range of coloured threads to choose from. We will work the basic design pictured above and you will leave with one part-completed ball, which you will be able to complete at home. You will be shown how to work an alternative 'rose garden' design. For those who would like to develop their skills, we also run further workshops, at levels 2 and 3.